Recombinant human CX3CL1 protein (ab9820) can be used as a positive control in WB. Our Abpromise guarantee covers the use of ab9819 in the following tested applications. 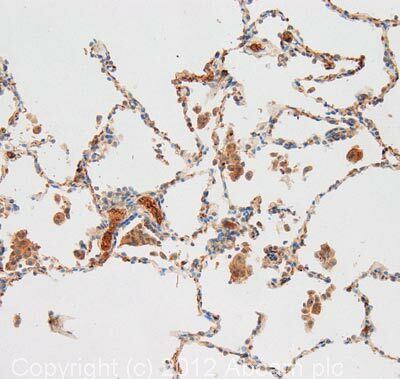 IHC image of CX3CL1 staining in human lung formalin fixed paraffin embedded tissue section, performed on a Leica BondTM system using the standard protocol F. The section was pre-treated using heat mediated antigen retrieval with sodium citrate buffer (pH6, epitope retrieval solution 1) for 20 mins. The section was then incubated with ab9819, 1µg/ml, for 15 mins at room temperature and detected using an HRP conjugated compact polymer system. DAB was used as the chromogen. The section was then counterstained with haematoxylin and mounted with DPX. Publishing research using ab9819? Please let us know so that we can cite the reference in this datasheet. I would like to ask you whether this antibody binds to the transmembrane or soluble form of cx3cl1. Thank you for your enquiry. ab9819 will recognize the chemokine domain of human Fractalkine (76 a.a.). The chemokine domain is amino acids 25-100 of the extracellular domain (25-341). The sequence of which is as follows: QHHGVTKCNI TCSKMTSKIP VALLIHYQQN QASCGKRAII LETRQHRLFC ADPKEQWVKD AMQHLDRQAA ALTRNG I hope this helps and if you have any further questions, please do not hesitate to contact me.